A fishtail braid is much like the name suggests: a herringbone crafted from hair. Its allure is largely the result of the intricacy of the overall design. Creating your own fish tail braid is not as hard as it may look. Although it will require a bit of patience to do it correctly, once you have grasped the concept satisfactorily you will be able to broaden the range of styles you are able to try on your hair. When crafted accurately your ponytail or up-do will look sensational and creative. To begin place all the hair into a ponytail with a clip that will keep the hair neatly in place. For a better outcome the hair should be dry and medium to long in length and devoid of layers. Segment the hair into two parts of equal portions. Take a small section from beneath the left segment of no greater than one inch and put it over the right segment of the hair. Allow the tiny bit now on the right side to combine with the right segment by freeing the thumb while grasping it securely. Repeat the step for the right side by using an equal section of hair from the right side and putting it beneath the left portion while holding it securely and allowing it to merge completely with the left side. You will continue doing this for the entire process being sure to pay attention to detail and by actually taking equal sections from each portion. Once you have completed creating the fishtail it should look symmetrical and masterfully woven. Grab an elastic band and tie it to the bottom of the braid to secure it and prevent it from unravelling. Ensure the elastic is one which will not entangle your hair causing split ends. You can place certain hair accessories in your hair to make the braid look more becoming. 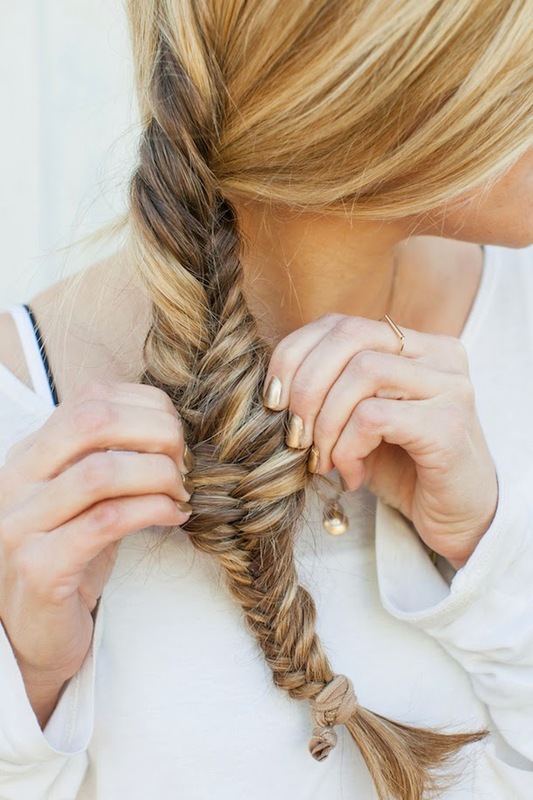 A couple well positioned pins with the right touch will make your fishtail stand out even more. It is actually easy to do once you get the hang of it. Be sure that you braid the hair to the bottom, so that should the elastic slip off, the hair will not instantly unravel. It will also look exceptional on hair that is thick with rich hues and highlights all over the strands. You can also add bangs to the hair to give it a bit more inventiveness to the style. 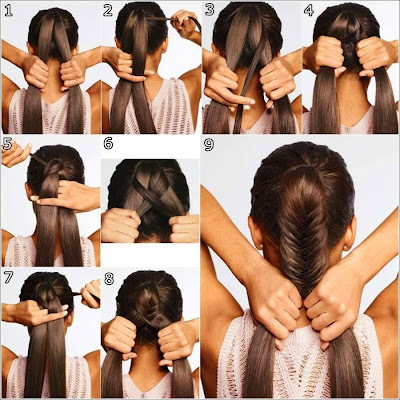 You can also do a full fish tail braid quite easily. 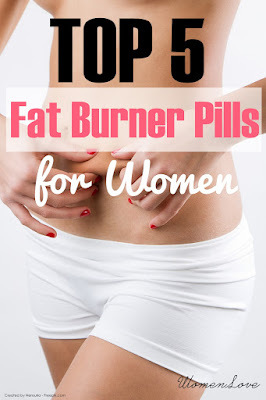 The steps will be similar with a little minor differences. Instead of using a clip to create a ponytail you will have to begin at the top of the head, if you are wearing a fringe then you will need to remove that segment from the braid. Create a triangular section and then proceed to overlap the hair as shown in the previous steps. 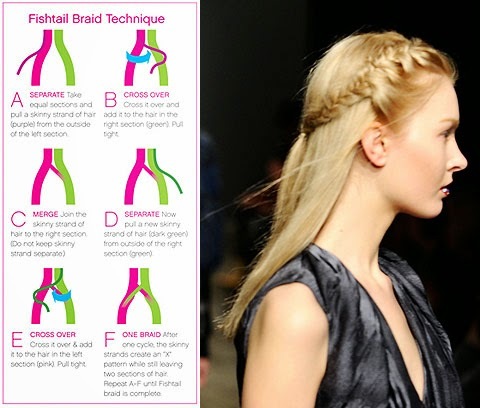 You may also wear the braid in an up-do once you have done a full head version of the style. By pinning it above or below the braid you will transform the style into a more regal display.